Family-owned watchmaker Breitling has made its debut in the smartwatch market, presenting a timepiece that is smart in functionality yet classic in design. 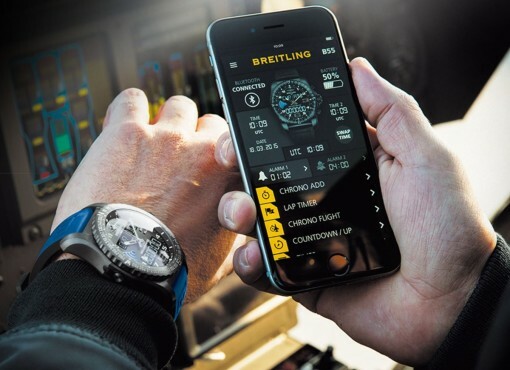 Launched in New York City in December last year, the Breitling Exospace B55 boasts a broad range of connective features, from smartphone compatibility to dual time zone display, whilst maintaining the brand’s iconic look. Unlike most standard smartwatches, the Exospace B55 features traditional analog time display as well as two additional screens on the dial, made possible by Breitling’s SuperQuartz movement technology. Powered by a rechargeable lithium-ion battery and made in-house by Breitling, the exclusive SuperQuartz technology affords the watch utmost accuracy. The integration of both analog and digital screens also facilitates the watch’s dual time zone function, enabling the wearer to display two different time zones simultaneously. Marketed as the instrument for men of action, many of the watch’s smart features are predominantly geared towards travel, aviation and sport; the chrono flight system records takeoff and landing times as well as airport codes, whilst the lap timer chronograph measures several times in continuous succession before displaying the best result. Smartphone pairing through Bluetooth Low Energy adds an additional layer of connectivity, enabling all data to be downloaded and stored, whilst the capacity to receive email, SMS and WhatsApp notifications renders the watch equally relevant to the everyday wearer. Equipped with a rotating bezel, black titanium casing and a two-tone TwinPro strap, both the watch itself and the smartphone application were developed and produced in Switzerland, as is customary for the luxury watchmaker; despite its highly connective functionality, the Exospace B55 is instantly recognizable as a Breitling, unmistakably derived from the brand’s classic analog models that are available on the market. In contrast, the original smartwatch concept is deeply rooted in technology, with tech brands designing their watches primarily as gadgets rather than traditional timepieces. The eagerly anticipated second-gen Apple Watch will no doubt draw on enhanced functionality and innovative new features, with rumors predicting the integration of a FaceTime camera as well as a wireless chipset, the Apple Watch is likely to become more functionally independent of the iPhone. Whilst brands such as Apple treat the watch as a gadget above all else, Breitling’s connected timepiece – alongside models such as the Tag Heuer Connected – adds a new dimension to the market, whereby high-end watchmakers focus rather on integrating state-of-the-art technology into iconic designs and years of traditional craftsmanship. Priced at $8,900, the Breitling Exospace B55 is a lightweight yet solid watch, with three different straps to choose from: blue on black, anthracite on black, or gray on black.